My dad used to have a cat before I came to live with him. He was just a regular shorthair tabby. His name was Mousebreath because he was found with a mouse in his mouth. The cat was my best friend, and he got me through elementary school. Even though he was kinda lazy, and flabby, I still enjoyed playing with him. He went away to someone else for a while, but he came back when I was in junior high. He was my partner up until my freshman year of high school. He died in the vet's office when he was about 15. The cat was older than me. And then my dad started hating animals, of course, I don't think he ever really liked his own cat, either. He would call him names and yell at him. It didn't help much that the cat would make a mess of the place, and throw up on the floor. And then my sister and my stepmother wanted another cat, and my stepmother's friend had one at her house, who had kittens. She didn't seem to be such a responsible owner because a lot of her other cats ran away. My dad was totally against having a pet, since he wanted the house perfectly clean and wanted all these new floors. But my sister usually gets what she wants anyway, and my stepmother's relationship with my dad was failing anyway for many other reasons. And then she brought home 2 kittens. I didn't ask for them at all, and I just wanted to keep the peace between everyone, but I knew it was going to fail anyway. But when I had one of the kittens, I got to play with her, and instantly bond with her. Both of the kittens were girls, and I named mine Luna, and my sister named hers Lilo. They were blotchy, Calico/Tortiseshell/Tabby cats. Luna was adorable. She would climb up on my shoulder and perch herself there, like a parrot. This was before she got really big, of course. But I also bonded well with Lilo. She was more sensitive, and a bit thinner than Luna (Luna would push Lilo's face out of the food bowl). But she would be the first to run up to you and rub and purr against you. And when you lean forward to pet them, they would stand on their hind legs. Sadly, they caused a lot of destruction. They scratched up the doors and chased after each other a lot, after clawing at each other. My dad gave them away after 7 years. But those cats were my best friends, and I wouldn't have gotten through senior year of high school if it weren't for them. But he would yell at them, and throw them off the table. And my stepbrother would bring his dog over, and let it chase them. And then my cats would run and hide every time they saw an adult male. I never really liked dogs. They always barked at you, and tried to bite you. They would run up to you, and sniff between your legs. Cats would sit by the window, and watch the scenery, and wait for you to come home. They always ran up to me as soon as they saw me outside. I actually have a cat myself that I named Mheetu, he's my therapy cat. He's not as much work as my old dog, Exodus. Exodus, I had to get rid of, because he was lots of work. The first day that I got him, he knocked out the air conditioner in my mom's apartment, ran outside, and one of my neighbors called the shelter. They picked him up and I went with my stepdad to retrieve Exodus. The woman was really serious about me not letting him run out again. I did have Exodus in a kennel that was placed in the living room. The kennel was made out of plastic, so it was easy for him to break free. I actually had Exodus crate trained, but I hated going on walks. Maybe, it's because I'm depressed, but that's no excuse for me being a complete idiot. I did get Exodus fixed and up to date with his vaccines. I even took him to the vet when he had worms. Bath time was another story. I eventually gave up Exodus. I did want to get him back, but I didn't want to go behind my mom's back, in order to get him back. Things are a lot easier now since I've gotten Mheetu. All I have to do is clean his litter box, keep him up to date with his shots, clean up after his messes, get him food, and change his food and water dishes. He's my therapy cat and I fear giving him up. He's a little overweight, I've been trying to work on way to get him at a healthy weight. I always keep thinking to myself that I'll screw up with him just like I did Exodus. What am I going to do when he gets sick? Have I ever thought about buying into pet insurance? I can come up with all the excuses that I want: "I bought Mheetu a cat condo." "I bought him toys." "I play with him, but am I still a good pet owner?" I got rid of Mheetu's cat clothes and he's greatly thankful for that. I've been thinking about how I am going to help him with the upcoming move. Anxiety fills my thoughts. The first night with Luna, she slept with me in my bed, and she woke up with me perfectly safe. My favorite animal are dogs. Specifically big ones. That way they can be the house's guardian. Bark and intimidate any wrongdoers. It's hard to say what's my favorite since I have both cats and dogs and love them all. It's weird to have a favorite animal when they're just different and unique from each other. My favorite animal will always be dogs, because they're lovable, loyal, and sweet. I happen to have three dogs in total. I won't deny they can be a bit of a handful at times, because they want outside a lot or want to go on walks a lot. Honestly, dogs make really good pets and make me feel a lot safer at home, whenever I'm by myself. Unfortunately, my mother is allergic to cats, therefore we can't own any. However, we have like three neighbors who have cats. So their cats come around our house sometimes, so we'll feed them. And they're great at killing the mice lurking in our fields from getting into our house too. Back in high school, I had a kid in my afterschool program that had an albino Burmese snake. He said he donated it to the zoo, I believe I saw the same snake at the local zoo. I'm just wondering if anyone on here likes snakes, it doesn't have to be a Burmese python. They're better than Oscars and Paku. I don't even know why Walmart sold baby Oscars as pets, they can get huge. I also saw a Pacu being sold as a pet at a local pet store. One of my ex-roommates said that she saw it's teeth when the employees of the pet store were feeding it a potato. I don't know who would want to have a fish with what appears to be human-like teeth as a pet. I am certainly out of that equation. My avatar answers the question well enough. I want to get one someday! I had parakeets once but they were very loud, sold em. Aw, they are so cute! I used to have three cockatiels, unfortunately, they never sang. This cockatiel has talent! How many birds that you have who can sing Darth Vader's theme music? godammit cockatiels are ridiculously cute. My mom had first started out with two cockatiels; a female named Star and a male named Rocky. Rocky was pretty timid, while Star was pretty mean. We had them for some time before they started mating, and they had a baby boy named Chomp Chomp. Then, on my younger half-sister's birthday, we discovered that they had another male chick, that my half-sister named Spongebob, the ultimate birthday gift, I suppose. Both of their boys; Chomp Chomp and Spongebob had a deformed foot, we never got their wings clipped. Star eventually died, because she had a hard time laying eggs, my mom was really upset when her bird died. We eventually moved from Virginia to New Mexico and my mom gave the remaining three cockatiels; Rocky, Chomp Chomp and Spongebob to a woman that she worked with. I don't know what happened to them. It happened when I was sixteen. I've thought about having a cockatiel, but if I have one. It won't be a female. I don't want to go through with what my mom went through with Star. My favorite animal will always be dogs, because they're lovable, loyal, and sweet. 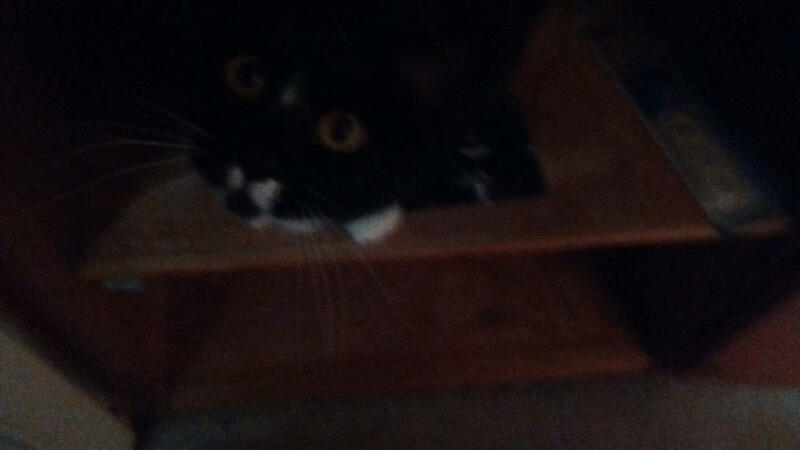 This is my cat, Mheetu, he loves to hide in the cabinets. Don't fall for his hypnotic gaze! W've always had dogs. Previously we've had a miniature schnauzer and a brown lab, but they've passed away, as we had them long ago. When my aunt and uncle moved away, they gave us their Pickinese and Poodle mix, but I've never met a dog so evil in my life. We gave it back to them, and the dog suddenly behaved. Since then we've gotten another miniature schnauzer (who we think has arthritis), and a yellow lab. My brother has a Guinea pig (his second one) and used to have fish and a frog. I'd love to have dogs and potentially a cat once I move out on my own someday. Dogs for me, all the way! My first pets were various fish that kept dying. Not that fish are easy to get emotionally attached to in the first place. Christmas when I was 7, we got Sally, a Dalmatian/lab mix. She was abandoned behind some guy's restaurant, and his wife brought her through my mom's pharmacy drive-thru to see if anyone could take her in. I had been bugging my parents for a dog for a while, and when the news came, I was super-excited! What a loyal dog, too. She protected my mom from attack from another dog, would alert my parents if we were talking in our sleep, and managed to survive both a move from southwest Florida to southeastern Washington state, and then from there to Utah. We had her longer than my younger brother was alive, so when she finally had to be put down(from what appeared to be stroke), we all cried. We waited about a year before we started considering getting another dog. Into our lives came Joey, a Shih-Tzu/Poodle mix who was up for sale in a local Walmart parking lot (which is mere feet away from a Pet-Smart). Much smaller, doesn't shed (Mom was insistent on that feature), a bit more yappy, and not a bit less lovable. He's almost 6 years old now, and is literally going gray as he grows older. Pics coming soon. Has anyone ever tried walking a cat on a leash? I think my cat outgrew his harness and I should try to fit him for a new one. The place that I am moving to has a dog park. So, the chances that I'll take my cat outside are slimmer than they are now. I love dogs as well as cats.